Work-related fatalities and injuries have been occurring at Tokyo Electric Power Company’s (TEPCO) Fukushima Daiichi Nuclear Power Station (FDNPS) frequently since 2014. The total number of such accidents in FY2014, ending in March 2015, is likely to more than double that in FY2013. On January 16, the Fukushima Labor Bureau requested TEPCO to take thorough and sufficient measures to prevent accidents at its nuclear power plants. Despite this request, three accidents occurred in close succession at FDNPS, the Fukushima Daini plant, and the Kashiwazaki-Kariwa plant in Niigata Prefecture during the period January 19 to 20, resulting in two deaths and one serious injury. In March 2014, an FDNPS worker engaged in repairing the foundation of the radioactive-waste storage facility died when he was buried under collapsed earth. Since then, fatal and serious accidents have occurred successively at nuclear power plants. All of the accidents could have been prevented if the workers had observed basic safety rules, and if sufficient safety measures had been in place at the workplaces. Although we have previously questioned the plant operator’s safety management capabilities and their attitude towards worker safety, we would like to do so once again. On January 19, an employee of a prime contractor died at FDNPS after he fell into an 11m-deep water tank, which was empty at the time. He was inspecting the container with two other workers at the top of the tank. He was said to have been wearing a harness, but the hook was not connected to the life rope. 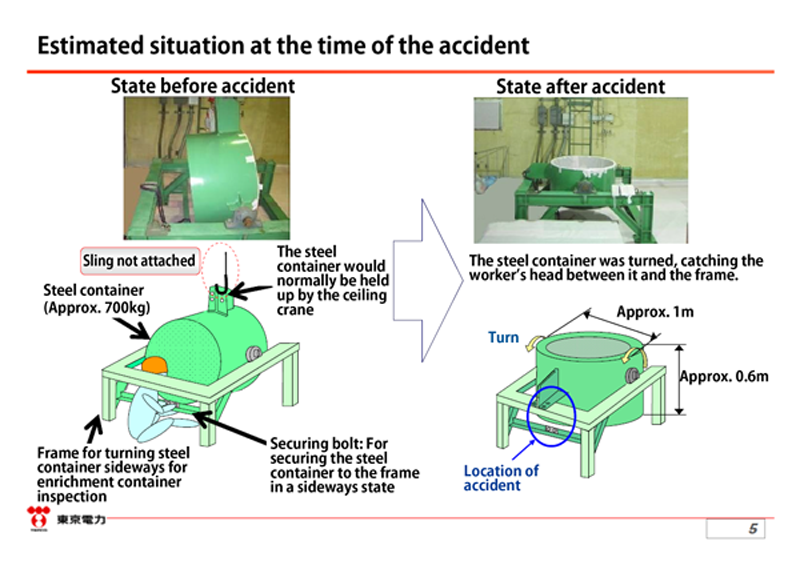 At the Fukushima Daini nuclear plant, a subcontractor employee preparing for an inspection in a radioactive-waste processing facility on January 20 died when his head was caught between the 700 kg steel container and its supporting steel frame. When the workers remove the bolts from the equipment, it is required that more than three people jointly secure the equipment firmly in advance using a crane. However, this process was not mentioned in the operating procedures manual, and the workers did not do so. At the Kashiwazaki-Kariwa NPP, a worker was performing an inspection and taking photos in a facility outside the Unit 2 turbine building on January 19 when he fell from the 3.5-meter-high passageway and sustained serious injuries to several parts of his body, including broken legs. He was not wearing a safety harness at that time. In TEPCO’s news conference on January 20, Managing Executive Officer Takafumi Anegawa said with a dazed look that he had come to realize that his company’s policies for improvements lacked effective measures. He said the common factor behind the three serious accidents that occurred at TEPCO’s three nuclear power plants at almost the same time was that there was something within his company which was obstructing its efforts to prevent such accidents. On January 22, the Health, Labor and Welfare Minister called on the TEPCO president to take every possible measure to prevent work-related accidents at NPPs. In response, the plant operator temporarily suspended operations at the three nuclear plants and launched safety inspections. At FDNPS, all operations were suspended except the water processing and sampling. On February 3, plant operations were resumed at the facilities as soon as the two-week safety inspections were completed. The results of the inspections were quite amazing. Of the 436 inspected operations, as many as 392, or 90 percent of the total, showed deficiencies in terms of safety management. New safety measures were therefore added to the working procedures, such as measures to prevent worker fall accidents. On March 28, 2014, an FDNPS worker engaged in excavation work to repair a debris storage facility died when he was buried in a mudslide. On February 5, 2015, the Tomioka Labor Standards Inspection Office sent the files of Tokyo-based first-tier subcontractor, Kenso Kogyo Co., which was the subcontractor for the repair work, to the Fukushima District prosecutors, along with files of the construction site supervisor, on suspicion of violating the Industrial Safety and Health Law. The subcontractor and the construction-site supervisor are suspected of having failed to take mudslide prevention measures, such as installing a wooden barrier in front of the piles of mud, when the worker was in the 2-meter-deep hole to repair cracks in the concrete foundation of the storage facility. They are also suspected of having failed to appoint a supervisor for the excavation work, as required by the law. This means that measures that are normally taken at other construction sites were not implemented at the NPP site. The construction-site supervisor claimed that he failed to take the mudslide prevention measures because the repair work had to be completed by the end of March 2014, and the excavation work was required to be done in a big hurry. Since 2014, the number of the various types of operations for containing highly-radioactive water has been increasing sharply at FDNPS. These include work to build more contaminated-water storage tanks, reinforcement of the advanced liquid processing system (ALPS) designed to purify contaminated water, and the operation to block the water flow in the section connecting the underground tunnel on the sea side of the turbine building with the building itself. At the plant, a great amount of underground water is running under the premises and flowing into the turbine building. As soon as the water touches the molten fuel, it becomes highly contaminated. The water then flows into the underground tunnel, and accumulates there. In addition, the construction of large facilities are currently underway. These include, for example, a new office building, the entry/exit management facility, and a facility for incineration of workers’ protective clothing and other radioactive contaminated refuse. 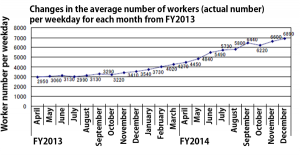 The number of workers entering the FDNPS site each day totaled 3,400 as of December 2013, but in December 2014 this total more than doubled to nearly 7,000. The graph above show the changes in the number of workers (actual number) per weekday.The forecast for the number (workers in cooperating companies and TEPCO staff) for February work calls for around 6,770 workers per weekday. Amid this situation, after the afore-mentioned fatal accident in March 2014, a series of worker fall accidents occurred in the May-June period due to poor footing and scaffolding. There were frequent accidents involving workers falling from ladders or make-shift hatchways and sustaining serious injuries. On September 30, a worker handling a high-voltage power cable was seriously injured when he received an electric shock. On November 7, two workers engaged in construction of a contaminated-water storage tank were hit by a 390 kg steel rail falling from the top of the tank. One of the workers suffered serious damage to his spinal cord and the other also suffered serious injuries. On January 13, 2015, another worker sustained serious injuries while performing decontamination work. A steel sheet being lifted by a crane hit him in the head. It is now about four years since the nuclear accident occurred at FDNPS. Despite this fact, there still remain severely contaminated debris that cannot be touched due to strong radiation, and highly contaminated “hot spots” areas at the plant. 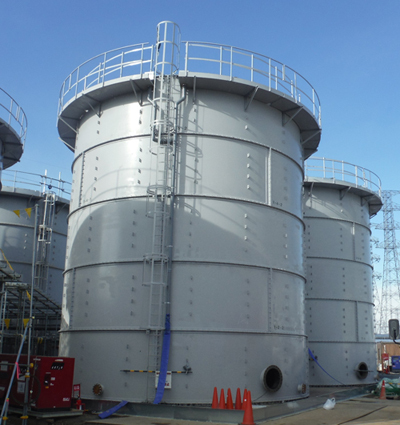 The forest of contaminated-water storage tanks is also posing a great threat. Workers are being forced to expose themselves to high-level radiation from the tanks. At FDNPS, workers are required to do many kinds of work that were previously unexpected and are not mentioned in the manual. Such work is totally different from the maintenance and inspection work that is routinely conducted at the plants under normal conditions. The workers are thus having to adjust to new types of technology, unfamiliar working procedures, and unprecedented methods for the planning and management of work plans. This is an extremely difficult task for workers. On February 16, TEPCO released the report on measures for preventing recurrences of work-related accidents requested by the Ministry of Health, Labor and Welfare and the Fukushima Prefectural Labor Standards Office. In this report, however, TEPCO presented only ordinary and predictable measures, for example, making efforts to enhance safety awareness by the prime contractors through sufficient communication with them about methods of supervision of daily construction work. Another measure included was to coordinate the period and areas of work in the work process adjustment committee and carry out thorough safety management. For the sake of inexperienced workers, TEPCO said it plans to set up an experience-based educational facility, placing emphasis on newcomer training and improvements in their ability to predict risks. Nevertheless, TEPCO has yet to formulate any drastic or fundamental countermeasures against work-related accidents. TEPCO has conducted questionnaire surveys on working conditions at Fukushima Daiichi NPS five times thus far. (The first survey was carried out in May 2012, the second in September-October 2012, the third in February-March 2013, the fourth in October-November 2013 and the fifth in August-September 2014.) Serious complaints about work were submitted to the survey by plant workers. Here are some examples of their complaints. If TEPCO had listened to their voices seriously and had taken the necessary countermeasures, it could have prevented most of the accidents that have taken place during the past weeks. Even now, however, TEPCO does not seem to be willing to lend an ear to the voices of the workers. TEPCO’s recent surveys on nuclear plant workers have revealed that the problems of many labor brokers disguised as subcontractors as well as illegal dispatching arrangements remain rampant. Another problem that has been disclosed is that the danger allowances are not paid properly. In August 2014, this writer provided consultation services directly to nuclear plant workers in Hiroshima, jointly with the “We don’t want nuclear power plants Hiroshima citizens group.” At that time, we discovered that some workers faced serious work-related problems, such as deductions from their salaries for mandatory health check-up fees, and compensation for the victims of work-related traffic accidents. Some other workers complained of the employer’s unilateral decision to change part of the labor contract. We reported on these illegal cases to the government officials in the negotiations held on January 26 between the citizens’ group and the government. This effort has successfully paved the way for an official investigation on these cases, as well as provision of guidance on corrective measures, by the Labor Standards Inspection Office. Moreover, some workers, engaged in emergency operations at the FDNPS and decontamination work in many parts of Fukushima Prefecture, complained of similar problems. They claimed that they were forced to pay for health examination fees, that their employers did not subscribe to the employment insurance scheme, that the compensation for the victims of work-related traffic accidents was deducted from their salaries, and that the danger allowances were not paid to the workers. Without employment security and the guarantee of payment of legitimate salary amounts, it will be impossible to improve the working environment in nuclear power plants. In view of this situation, we are determined to support nuclear plant workers through consultation services, in collaboration with the National Occupational Safety and Health Center, the National Network for the Concerns of Workers Exposed to Radiation, and other related organizations and groups. At the 13th negotiation meeting held on February 19 between the government and the National Occupational Safety and Health Center, in which this writer and other people concerned also participated, discussions were held on such issues as how to prevent disguised subcontracting, illegal dispatching arrangements and violation of labor laws. We demanded that the Labor Standards Inspection Office collect data on the FDNPS workers who had faced problems involving the Labor Standards Law, the Employment Security Law or Worker Dispatch Law, and the Industrial Safety and Health Law. To achieve this, we also demanded that a system of collaboration be established between the Ministry of Health, Labor, and Welfare and the Nuclear Accident Response Office of the Ministry of Economy, Trade and Industry’s Natural Resources and Energy Agency. In the same negotiations, we made two additional demands concerning prevention of work-related accidents at FDNPS. One of these was that a provision be added to the Industrial Safety and Health Law to the effect that the nuclear plant operator is responsible for management of the plant workers’ radiation doses and other matters related to their health and safety. On January 22, 2015, the Health and Welfare Minister called on TEPCO to be aware that the company is not only the contractor but also the owner of the nuclear power plant and the party responsible for the 2011 nuclear accident. With this awareness, the utility should take all possible measures to prevent work-related accidents, said the minister. However, TEPCO has no responsibility for the matters provided for in the Industrial Safety and Health Law, and no matter how strongly the minister demands that the firm gain the required awareness, there is a limit to the effect of his request. The second demand was that the government office in charge of supervising nuclear power plants station officials at FDNPS at all times and, jointly with the plant operator, make best efforts to prevent work-related accidents at workplaces. 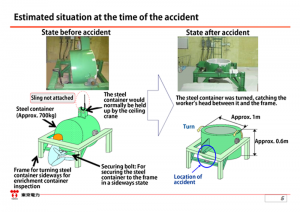 TEPCO totally lacks a sense of responsibility for work-related accidents, and does not have the ability, experience, nor technology to prevent such accidents. Given this situation, if TEPCO is left in complete charge of this matter, it will be impossible to prevent further accidents. We will, therefore, maintain steady efforts to negotiate with the government and request that TEPCO take effective measures. The radiation exposure dose limit for emergency workers at the FDNPS has been raised from 100 mSv to 250 mSv due to a concern over great difficulties in carrying out the nuclear accident cleanup operations. The higher official limit on emergency workers’ effective exposure doses was put into effect on March 14, three days after the Great Tohoku Earthquake occurred. On that day, a Nuclear Emergency Situation declaration was issued, and the higher exposure limit has been imposed whenever it was absolutely necessary since that time. Although the declaration has yet to be lifted even now, four years after the nuclear accident, the 250 mSv limit was lowered on December 16, 2011 when former Prime Minister Yoshihiko Noda declared an end to the most critical phase of the accident at FDNPS. At present, the Nuclear Regulation Authority (NRA) is considering raising the maximum radiation exposure limit for emergency nuclear workers again. This is planned for the purpose of maintaining nuclear power on the assumption that severe accidents may occur at nuclear plants, and sacrifices the health of exposed workers for that purpose. At its meeting on December 10, 2014, NRA expressed its intention to study plans to raise the exposure limit for emergency workers to 250 mSv and to manage emergency workers’ exposure doses separately from those of non-emergency workers. Article 3 of the law concerning technological standards for prevention of radiation hazards stipulates that the basic rule should be to set the radiation exposure limit for workers and the general public handling substances or equipment generating radiation for which the standards are applied at a level below which radiation hazards may emerge. According to NRA, there are no existing documents that prove radiation exposure of up to 250 mSv can cause acute clinical radiation hazard symptoms. Based on this belief, the committee is discussing its plan to raise the emergency exposure limit to 250 mSv. In our negotiations with the government on January 26, we referred to this point and presented a number of cases in which radiation exposure of less than 100 mSv had caused acute radiation symptoms. One of these was a number of iridium exposure accidents that occurred in Japan in 1971. Another case we cited was that of soldiers from Kamo-gun, Hiroshima Prefecture, who entered Hiroshima City on August 6, 1945, immediately after the atomic bombing. They also developed acute symptoms after suffering radiation exposure of less than 100 mSv. We then requested that NRA study possible damage to worker health that might occur by raising the exposure limit from the current 100 mSv. The separate management of emergency exposure doses and non-emergency exposure doses means, for example, that an emergency worker who suffered 250 mSv of exposure, did non-emergency work on other occasion because he is legally allowed to do so, and suffered 50 mSv more exposure, would have an annual exposure dose totaling 300 mSv. 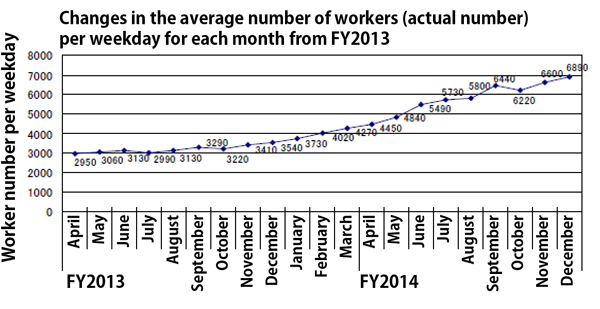 If he continues to do the non-emergency work in the following year, the total would reach 350 mSv. Indications are that in the future workers will be exposed to a far greater amount of radiation. The Ministry of Health, Labor and Welfare, however, issued a circular notice advising workers with exposure doses of over 100 mSv not to engage in further work involving exposure to radiation. In the negotiations with the government, we insisted that NRA’s attitude in approving separate management of emergency exposure doses and non-emergency doses without taking into consideration the Ministry of Health, Labor and Welfare’s circular notice is totally unacceptable. The NRA secretariat refrained from discussing the matter, saying it would now begin to study the issue. Workers who agree to do emergency work no matter if their annual exposure doses exceed the official limit, should do so as “volunteers”. But this necessary condition does not fit with the existing labor laws. Article 25 of the Industrial Safety and Health Law stipulates that business operators are required to take necessary safety measures for their workers, such as evacuating them from their work sites. In negotiations with the government on February 19, we asked the Ministry of Health, Labor and Welfare to notify NRA and the government of the fact that business operators are not allowed to force their workers to do emergency work, because such work should be done voluntarily. As things stand now, we will observe closely the development of future discussions on this issue at NRA and the Radiation Council.